This component uses the JIRA API to retrieve data and load it into a table. This stages the data, so the table is reloaded each time. 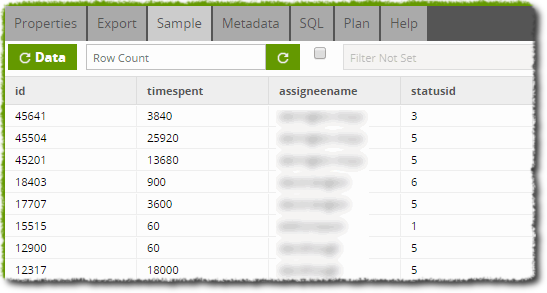 You may then use transformations to enrich and manage the data in permanent tables. Basic/Advanced Mode Choice Basic - This mode will build a Jira Query for you using settings from Data Source, Data Selection and Data Source Filter parameters. In most cases, this will be sufficient. Advanced - This mode will require you to write an SQL-like query which is translated into one or more JIRA queries. Password Text A valid password for the Username above. (This is not always required.) Users have the option to store their password inside the component but we highly recommend using the Password Manager option. URL Text The URL of the Atlassian account that the target username belongs to. Data Source Choice The name of a JIRA collection. Collections are analogous to Tables in other databases. Limit Number Provides an upper limit on the number of rows retrieved from the JIRA server. Leaving this field empty means Jira Query will fetch all records. Value A value for the given Parameter. The parameters and allowed values for the JIRA provider are explained here. Connect to the JIRA service and issue the one or more API calls. Stream the results into objects into the staging area, recreate or truncate the target table as necessary and then use a COPY command to load the S3 objects into the table. Finally, clean up the temporary S3 objects. In this example we will be utilising the Jira Query component to take issue data from a JIRA account. The eventual goal of this data will be using it to identify average work times on jobs and thus we want to format the data to be ready for such an analysis. We begin by constructing a simple Orchestration job that creates a new table and loads JIRA data into it. 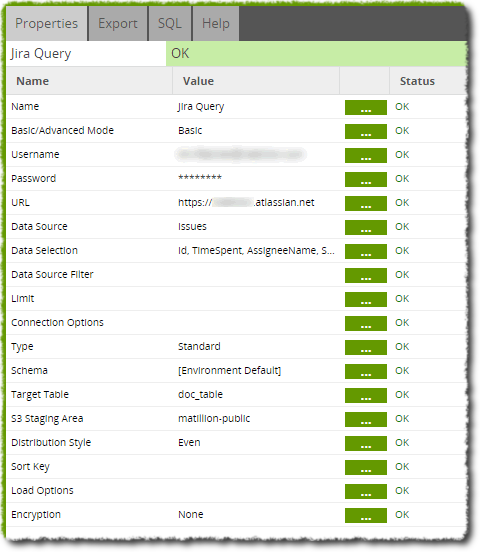 The Jira Query properties are shown below. We have entered a username and password that is attached to the JIRA account shown in the URL property. Since we are interested in importing data about issues, we use 'Issues' as the Data Source and select just a few columns in 'Data Selection'. We take the ID of the issue and the timespent, the AssigneeName and StatusID. Although we don't strictly need the AssigneeName and StatusID for this example, they are obvious candidates to pair with the issue data for later analysis. Meanwhile, a few other properties have been assigned; the component must have an S3 Staging Area and a Target Table. Everything else is left blank as we don't wish to specify sort keys or limit our data collection. If we run this job, we can then sample the output in a Transformation Job. Unfortunately, we can see that many issues don't have a 'timespent' value. 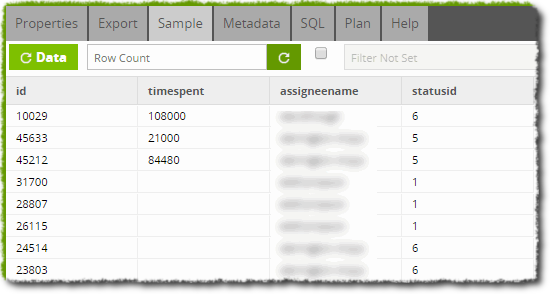 To ensure our data is uniformly useful, we opt to filter out any row where the timespent property is empty (NULL). This filter can be used directly on the Jira Query component (using the 'Filter' property) or indeed by a Filter component attached to the Transformation job as shown below. In either case, the filter is set up as shown below. The filter is set up to find any row where timespend is NULL and remove it. Sampling the new output shows our ideal data.